I've been a big Scrabble fan since I was a kid. I play it with my family, with my friends and, sometimes, even with strangers online. Now, three years after Electronic Arts (EA) brought the classic board game to the iPhone and iPad, Scrabble is finally coming to Android phones. It's not clear what took EA so long to create their Android version, but what is clear is that it wasn't all time well spent. The free app launched this week is riddled with ads and is missing some of the functionality of the iOS versions. If the goal was to build up even more anticipation for a paid app, the strategy succeeded. 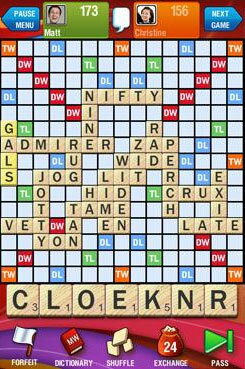 Scrabble for Android retains many of the core features Scrabble buffs are looking for. You can play friends in a "Pass n' Play" mode, over Facebook or through EA's new Origin platform to play friends on Apple iOS and Android devices. Both Merriam-Webster and TWL dictionaries are available, and there is a "Teacher" mode, to help you learn optimal word placement. But the free Scrabble version requires that you be connected to a data network — cellular or Wi-Fi — in order to play. So if you want to get a game in with a companion on the airplane or subway, you're out of luck. And why does Scrabble need this constant data access? So EA can serve up some of the most intrusive ads I've seen in any app. Full-page ads appear constantly between moves and when navigating between games and the menu, blocking gameplay until you close the ad (which crashed the game, in some cases). Unlike the paid versions for iOS, Scrabble for Android also doesn't offer a single player vs. computer mode, and Pass n' Play is limited to two players. As an avid Scrabble player, I'm very happy to see Scrabble finally make it to Android, but am eagerly awaiting a paid version without the ads and feature compromises. In the meantime, the free version is available for download from the Android Marketplace. I agree! I am sickened by the poor quality of the scrabble app and plain POd that there is no paid version or single player without being connected to the network! I used to play while traveling, etc. Just plain garbage if you ask me. Ive never had an app crash as often or have hundreds of ads (which i ignore anyway!!! Never have and NEVER will click in one!) like this scrabble free!